Jerry Siem began his fishing career working at Will Godfrey’s original fly shop on the Henry’s Fork River. While there he developed a real talent for building rods. His first saltwater experience came in the mid 1970’s while tarpon fishing with a hefty fiberglass rod aboard legendary Key West Captain Ralph Delph’s boat Vitamin Sea. Jerry’s proficiency in rod-building and design quickly earned him a reputation as one of the finest rod designers in the world and led him to a career as the chief rod designer and engineer for Sage Fly Rods. He was the on-site casting consultant for Tom Skerritt, Brad Pitt and Craig Sheffer in the movie, “A River Runs Through It”. 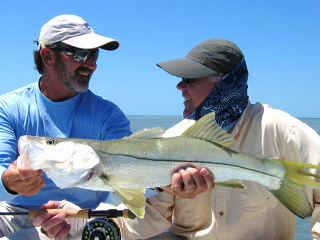 The lure and enjoyment of saltwater fly fishing led Jerry to Belize, Baja Mexico, the Bahamas, Christmas Island and up and down the East and West coasts of the US. Once while fishing in the Florida Keys he caught a permit and bonefish on modern graphite rods and completed a grand slam by landing a 90 pound tarpon on a cane rod which he had designed specifically for the task!